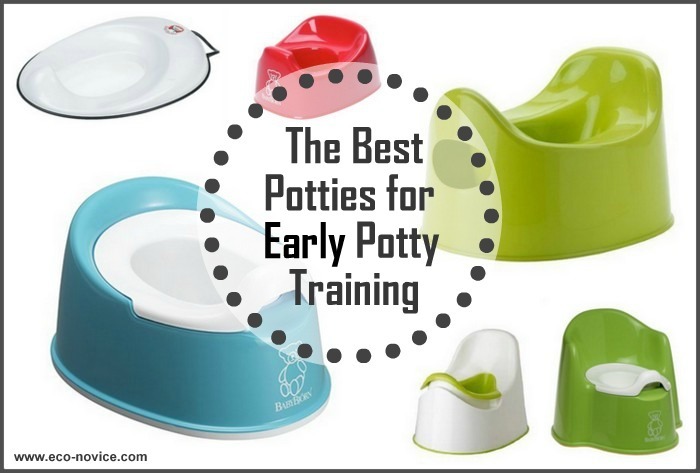 As parents, it is hard not to worry about all the things in life that could go wrong. Unfortunately, there are risks even to simply enjoying the great outdoors! Where I live we have to contend with West Nile Virus from mosquitoes, Lyme Disease from ticks, rattlesnakes, mountain lions, accidental injuries, and, of course, skin cancer. Most people know that skin cancer is the most common form of cancer in the U.S., but what you may not know is that rates of skin cancer have tripled in the last 35 years. 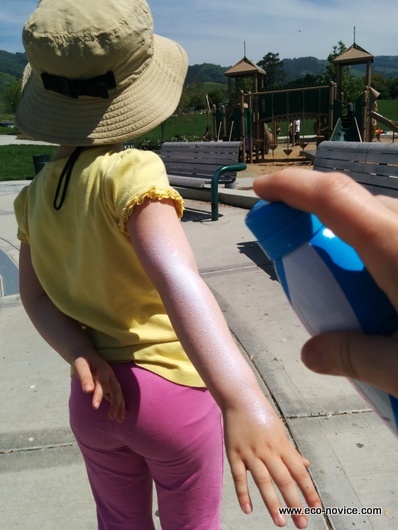 Sun safety -- covering up and using safe, effective sunscreen -- is especially critical for children, since serious childhood burns can double a person's chance of developing skin cancer. So does this mean we should avoid spending time outside? Of course not! After all, the benefits of spending time outside (and the risks to spending too much time indoors) cannot be ignored either! The amazing benefits of time spent in nature include: reduced stress, better attention and cognition, better immune functioning, decreased anxiety and depression, and an extended lifespan! While time indoors exposes you to indoor air pollution as well as health problems associated with a more sedentary lifestyle. 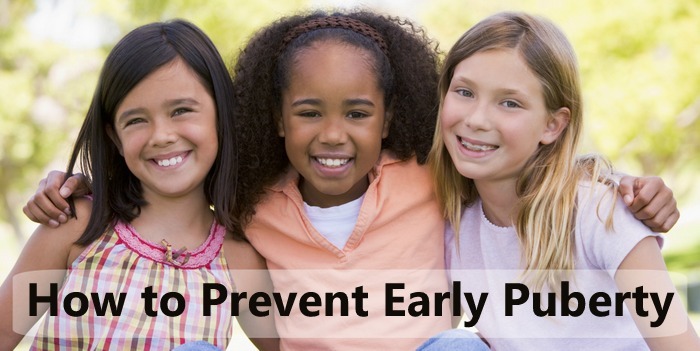 Recently scientists have even suggested that too much time indoors may be responsible for the rapidly rising rates of myopia (near-sightedness) in youth. The solution is clear: spend lots of time outside (we aim for at least 30 minutes in nature everyday!) but be aware of and mitigate the risks. We come inside at dusk when the mosquitoes are out in full force. We check for ticks after hikes. 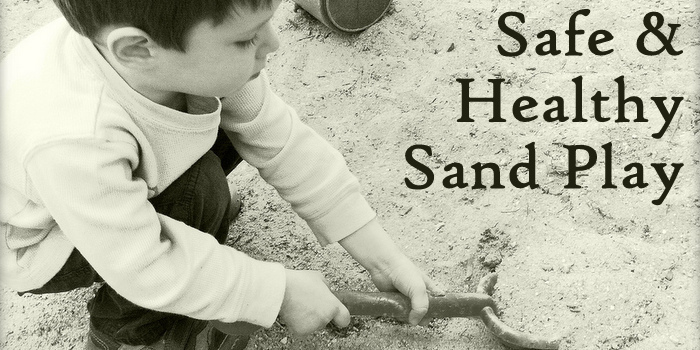 We discuss with our kids how to recognize and react to rattlesnakes and mountain lions. Whenever practical, we cover up with long sleeves, long pants, and hats while outside. And during the sunny summer months in particular, we wear sunscreen. Lots and lots of effective & safe sunscreen. 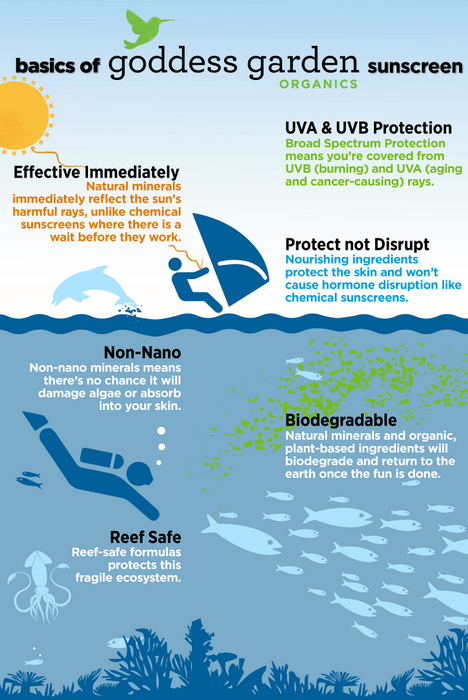 Because some sunscreens do not effectively protect against UV rays, and others contain toxic ingredients that may actually increase your chance of cancer and other health problems. Mineral or physical sunscreens rather than toxic chemical sunscreen. Mineral sunscreens reflect sunlight and provide a physical barrier between you and the sun's rays while chemical sunscreens absorb the UV rays. Chemical sunscreens such as oxybenzone are also known endocrine disruptors. Broad spectrum protection against both UVA and UVB rays. UVA rays damage DNA and cause aging, while UVB rays cause burns. Both types of rays have been linked to skin cancer. 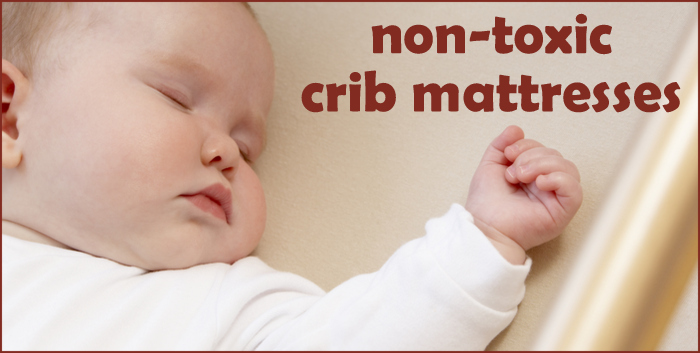 No nano-particles (generally considered to be particles smaller than 100nm). Many sunscreens that use mineral sunscreens utilize nano-particles to avoid the sunscreen leaving a ghostly white sheen on your skin. But there are health concerns associated with applying super tiny particles to your skin. Free of harmful ingredients such as Vitamin A/ retinyl palmitate (which may actually speed development of skin cancer), fragrance, hormone disrupting chemicals, liquid plastics, and alcohols. Garden Goddess Organics sunscreens offer all the above and more! We have been using Garden Goddess Organics products for over a year. 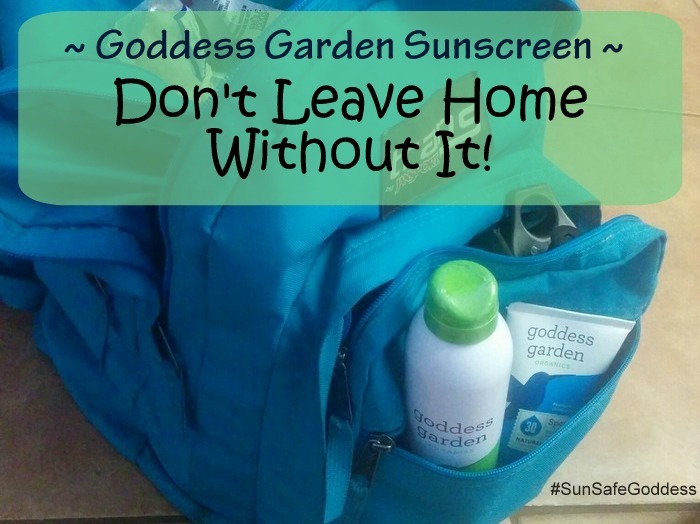 Last summer we used Garden Goddess sunscreens nearly daily for swim lessons, beach trips, hikes, and other frequent outdoor adventures. While wearing the sunscreen as advised (reapplying every 2 hours, or more often when in water), we never got burnt. It rubs in easily and does not leave any ghostly white residue. We love the convenience of the continuous non-aerosol spray and trigger spray for wiggly limbs ready to jump in the pool, run across the sand, or hit the playground. 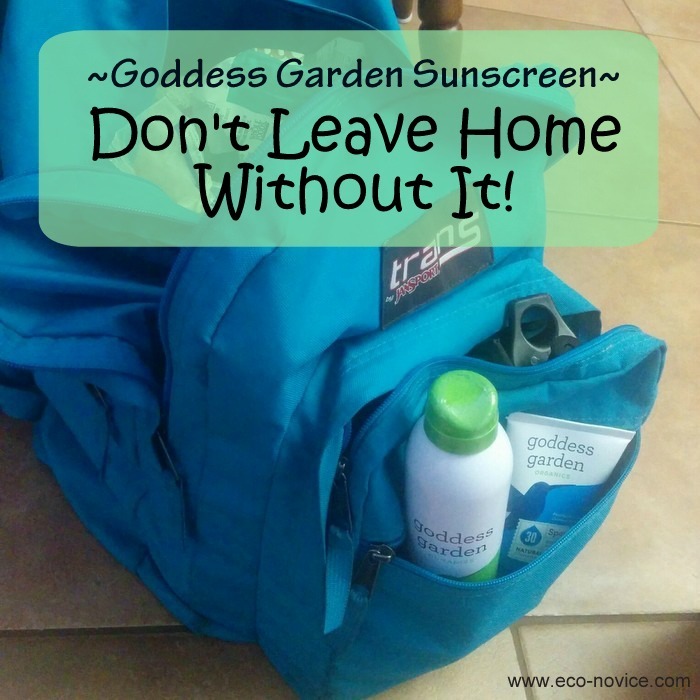 Garden Goddess makes the only safe and non-toxic sunscreen spray I am aware of, and it’s the only spray I have ever considered using. We use the tube lotions almost daily on our faces. The sport sunscreens offer 80 minutes of water resistance and are perfect for swimming and beach days, or active outdoor adventures that will involve lots of sweating! So get outside and enjoy nature, worry-free! When you use Goddess Garden Organics sunscreen, you can protect your family against sun damage without any adverse effects on your family’s health or the environment. 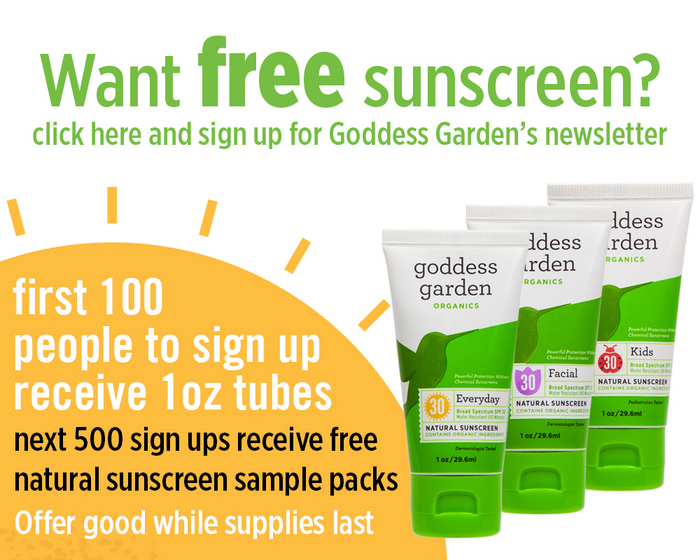 You can try Goddess Garden Organics sunscreen yourself for free right now! Simply be one of the first 600 people to sign up for their newsletter. The first 100 people to sign up receive 1 oz tubes. I keep this size in my purse at all times, just in case I ever forget my regular tube. It is also a great size for travel! 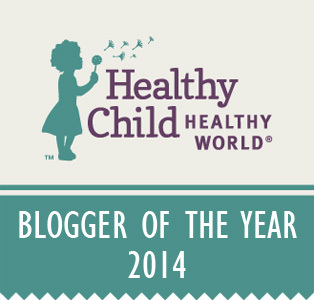 The next 500 sign ups receive free natural sunscreen sample packs (perfect for on-the-go!). Offers good while supplies last. Note: all free 1 oz tubes and sample sunscreen have been claimed. 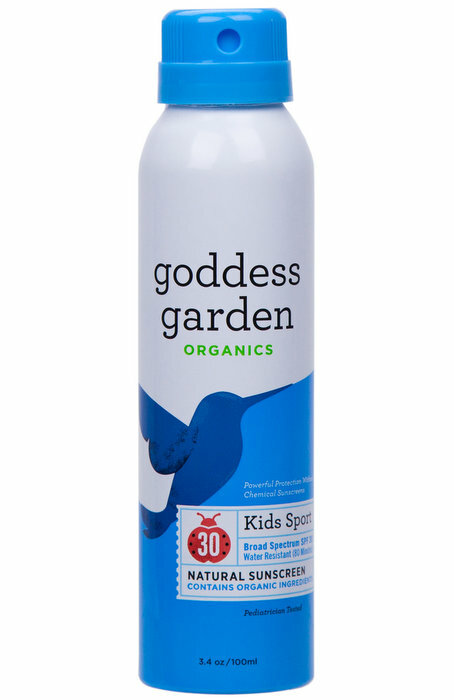 You can purchase Garden Goddess sunscreen for 20% off now through July 31st with the code #SunSafeGoddess. 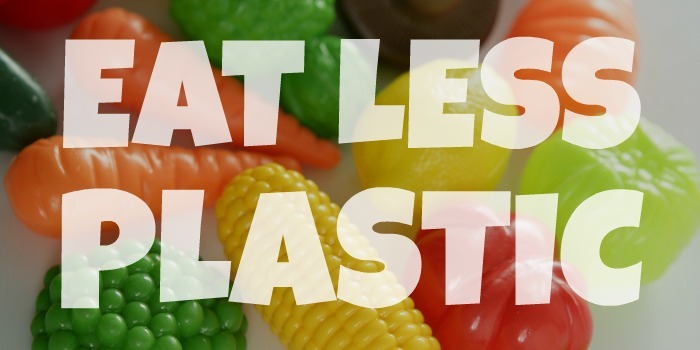 Don't miss this chance to stock up for the summer! This is my new go-to sunscreen this year. My entire family loves it! We need to do a better job about applying sunscreen regularly. I usually just opt for a hat but that is not fail safe. I love this year's formula even better than last year's! Love this brand! Apply sunscreen and keep safe yourself from skin cancer or any other dangerous disease. Thanks for the post.